This ministry is comprised of a group of church staff and volunteers who have a special heart to make the gospel and church community life accessible to people with special needs as equally important parts of the church body. We also understand that caring for an adult or raising a child with special needs can be a major undertaking for the entire family. 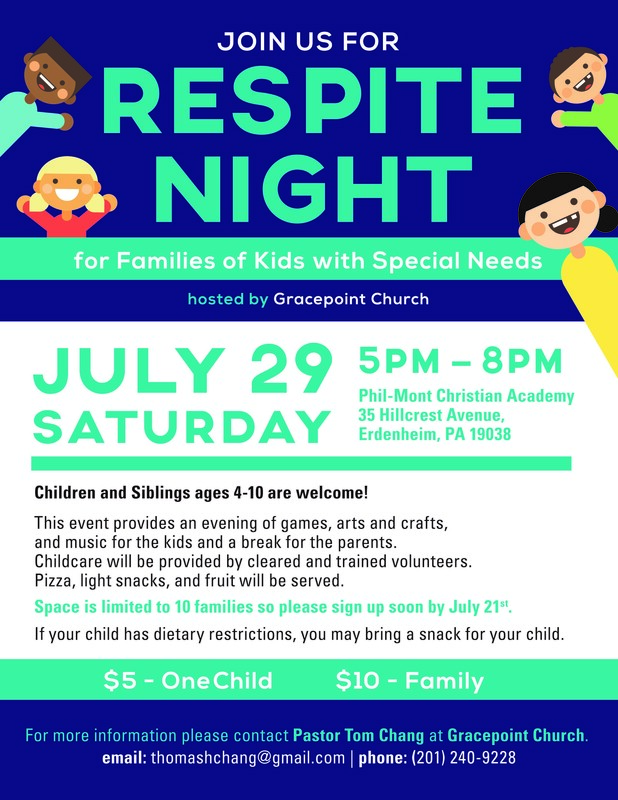 To show gospel-centered love and hospitality to Gracepoint church and community members in the Greater Philadelphia area with special needs by serving with faithfulness and mercy as co-laborers with them in order to support their devotion to Jesus Christ and their belonging as an equal part of the Body of Christ. One area of this ministry is Respite Care. 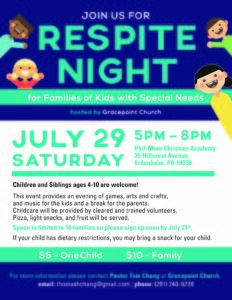 If you are interested in finding out more information about this ministry, please contact Tom Chang, Assistant Pastor at Gracepoint Church. To download our special needs family intake form, please click here. Click for more info about this event!